Stock photo of an information sign at the The Joseph Schneider Haus, a National Historic Site of Canada, in the city of Kitchener,Ontario, Canada. In front of the Joseph Schneider Haus is a information plaque concerning the history of the house. 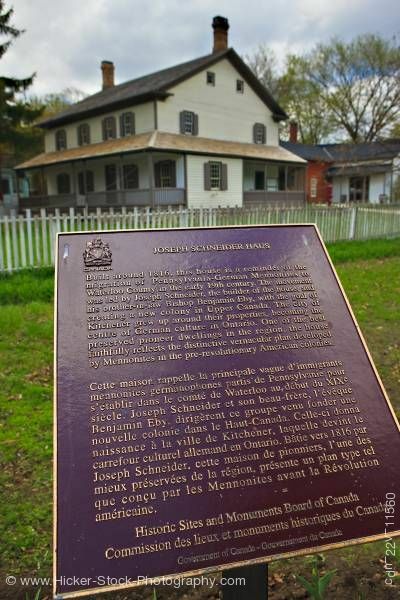 This stock photo shows the information plaque on the history of the Joseph Schneider Haus, a National Historic Site of Canada, in the city of Kitchener, Ontario, Canada. A historical plaque sits in the front of the Joseph Schneider Haus. The plaque has detailed information concerning the Joseph Schneider and his historical house. The raised letters on the plaque is written in English and French. The Canadian coat of arms is located in the top left corner of the plaque. Behind the sign is a picket fence which is in front of the historic home of Joseph Schneider. A two story home has chimneys on each end of the house. A porch wraps around the house. The house is painted tan with brown trim. A few buildings sit in the background of the house.